Here in the San Francisco Bay Area there has been a marvelous resurgence of what we call the “Oral Tradition” in the past twenty years. It’s expressed in many forms. Storytelling festivals attract hundreds of listeners, as do visits by poets such as Robert Bly, Coleman Barks, Mary Oliver and David Whyte. Three thousand people attend the Northern California finals of the Youth Speaks Teen Poetry Slam competition (www.youthspeaks.org). There are poetry readings, slams, spoken word events and “story swaps” every night of the week. And something else has been going on. Around 1990 some of us, initially at Doug Von Koss’s prompting, began to meet for informal Oral Traditions Salons. We quickly installed only one rule: no reading! We encouraged each other to feel the difference between hearing poems read and poems told “by heart.” Very few of the poems were original. We had Yeats, Rumi, Dickinson, Rilke, Oliver, Hafiz, Neruda, Machado and many others to pick from. It was a stretch: actually working with a poem until one knew it so well that it came out of one’s own experience, out of one’s own bones and heart. People, of course, chose to memorize only those poems that were deeply meaningful to them. So recitation of those poems within a circle of people with deep intention and attention – in ritual space – became an act of self-revelation. We encouraged real listening, rather than shuffling papers and preparing for one’s next poem, as people do at many poetry readings, which I, frankly, do not enjoy. When someone finished a poem, someone else who was deeply moved might ask him or her to repeat it. Sometimes we’d sit in silence until someone was truly inspired by that poem to contribute another one by the same poet, or perhaps a poem on a similar subject. The mood would shift from poems of love, praise and spiritual ecstasy or longing to humor to anti-war laments, loss and deep grief, and back. This was real communication, but in beautiful images. “Words I have,” says Yeats, “…that can pierce the heart.” We gradually realized that we were independently re-imaging the old Sufi tradition of the sohbet, a poetic conversation between friends of spirit and heart. Eventually, some of us went public. Around the year 2000 in Berkeley, Dan and Dale Zola began to organize annual “Great Night Of Rumi” and “Great Night of Soul Poetry” events, in which some of us recited poetry along with musical improvisation to crowds of up to three hundred people (www.dzola.com/berkeley_poetry_performers.asp). Meanwhile, Larry Robinson presented the first Rumi’s Caravan in Sonoma County (www.rumiscaravan.com), a poetic conversation that has since appeared in a half-dozen locations from Oakland to Mount Shasta. The surprisingly large crowds we attract indicate that there is a great hunger for this kind of “from the heart” sharing. Beyond that universal hunger, we sensed the necessity of making beauty for its own sake. Again, with prompting from Doug (recently retired as prop master at the San Francisco Opera House), we attempted to make the stage backgrounds stunningly gorgeous and to invite the most soulful music accompaniment. We have found musicians who are capable of intuiting the emotions and tone of a poem as we recite it. We sometimes offer an additional treat, an actual Sufi dancer doing the Dervish “turn” as Rumi is said to have originally done it. Sometimes we offer Middle Eastern food and encourage audience member to dress lavishly, to join in with our attempt to bring soul back into the world. Am I getting a bit inflated here? Great! And there’s more: I’m willing to entertain the possibility that these events have long-term political implications. Interest in the Oral Tradition has grown so quickly because we need it, as the postman said. Modern people and Americans in particular suffer from an unprecedented impoverishment of the imagination. Our popular and political cultures have become so diminished because to a great extent we’ve lost the ability to think in mythic or metaphorical terms. But the revival of the Oral Tradition counters this slide into literal thinking with an invitation to speak from the heart, with images that go past the head and convey the richness, ambiguity, tragedy, mystery and potential of the soul. Imagination is the fundamentally human gesture, “the capacity to see things that are not there,” says Michael Meade. Imagination builds a bridge between fate (what is given to us) and destiny (what we do with it). Then, says Lorca, the artist stops dreaming and begins to desire. Love moves from imagination, which “creates a poetic atmosphere,” to inspiration, which invents the “poetic fact.” Thus the imagination, engaged by the restoration of memory, moves us from invocation to inspiration, where new life comes not from us but through us. Now, all creative acts have political implications. Dianne Di Prima writes, “The only war that matters is the war against the imagination.” Another poet, Frances Ponge, says that genuine hope lies in “…a poetry through which the world so invades the spirit of man that he becomes almost speechless and later reinvents a language.” Perhaps we are required to collapse so deeply into the mournful realization of how much we have lost that we become speechless. Perhaps only from that position can new forms of art and language arise that might break the spell of our amnesia. Thank you Barry. Keep up the good work! I’ll look for a short poem for a short memory. I’ve been memorizing poetry on and off my entire life. To have those beautiful words bumping around in my head instead of my usual thoughts is worth it alone. But having those words and turns of phrase become part of my language, to learn something of the skill of eloquence…it is no small thing. and I have never used another method since. I’m in New York City and am now feeling stirred a bit to hold an Oral Tradition Salon. Thanks. 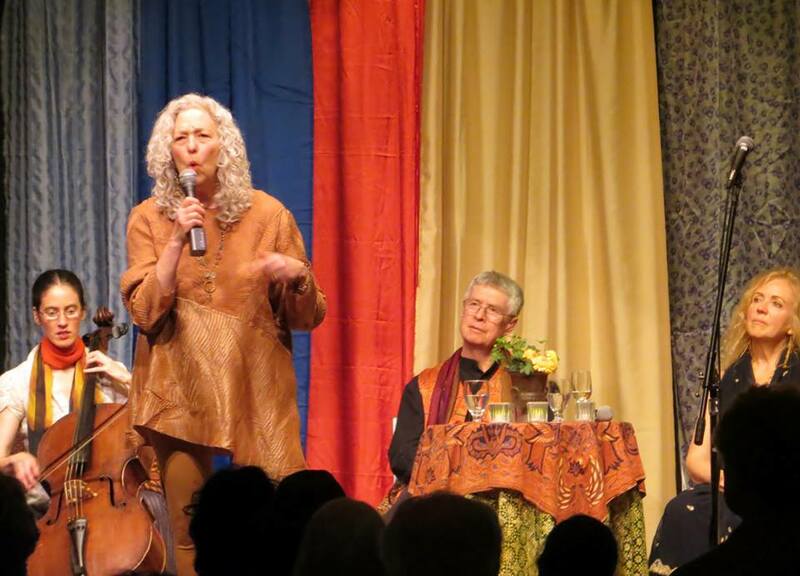 Kim and I have appeared onstage together as part of Rumi’s Caravan. I’m glad you’re considering hosting a salon. It does take a while to build up the community and the willingness to offer memorized poems and stories. The emphasis should be on the poetic conversation rather than on performance, and that it’s OK to just listen. Good luck!